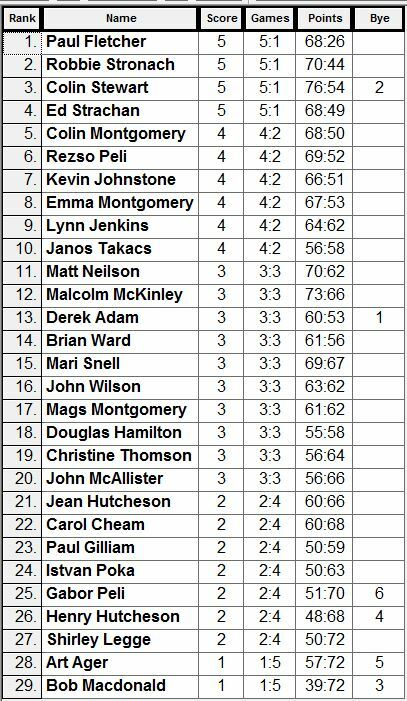 A total of 29 players contested the SPA Singles title at Inverleith PC on Saturday 22nd August. As usual we were treated to breakfast rolls and a hearty lunch by our hosts, many thanks to Inverleith for their hospitality. The format was a 6 rounds ‘swiss ladder’ with players ranked on wins and then points difference. Heading into the final round, previous winner Robbie Stronach looked like he would once again lift the title as he was the only player with a perfect record. However Ed Strachan had other ideas an beat Robbie in the final game. Paul Fletcher (ranked second going into the last round) beat Kevin Johnstone convincingly in the final round and, in the end Paul finished in first place. Robbie was second and Colin Stewart scraped into third following a 13-12 win in round 6 against Rezso Peli. Paul Fletcher and Emma Montgomery (the highest ranked woman) will be invited to represent Scotland if we are invited to compete in the European Singles Championships in 2016. The full results are shown at the bottom of the page. In the gaps between Singles games, players were invited to register a qualifying score in the shooting, with the top 4 placed players to shoot out in semis and a final. The qualifying rounds were tight, but the top 4 were: Reszo Peli – 21, Kevin Johnstone – 21, Colin Stewart – 20 and Derek Adam – 19. In the first semi Derek defeated Reszo by 25-8. In the second, Colin defeated Kevin by 34-23. In the 3rd place playoff, Rezso narrowly beat Kevin 15-14. The final was equally close with Colin beating Derek 23-21 (Colin hit 2 jacks in the final discipline to take the win).